Just last week, we wrote about the lack of safe bike parking at Seattle’s newly-remodeled Garfield high school. I meant to send the school district an email then but procrastination got the best of me. This evening, Cascade’s Braking News highlighted the problem in it’s Advocacy Issues section; I couldn’t let the opportunity to speak my mind pass again. I sent the following email to the Seattle School Board. If you live in Seattle, I encourage you to do the same. If you live in any other place with inadequate bike parking anywhere, let the powers that be know it’s unacceptable! Just last week I read an opinion piece in the Seattle PI about the lack of adequate bike parking at newly remodeled Garfield High School: http://seattlepi.nwsource.com/opinion/356545_truax27.html I should have written this email then, as I was completely amazed that a $100 million remodel wouldn’t include something as simple as adequate bike parking for students and staff. It’s very hard to believe the Seattle School District isn’t doing its part to ensure students and staff have adequate parking for bicycles – a simple, fast, healthy and economical way to get to school. The Seattle School District should be encouraging students and staff to ride their bikes to school by providing simple, low-cost bicycle racks and shelters. 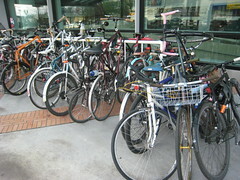 Bike parking is a bargain compared to the cost of building and maintaining automobile parking spots. Our family of four gets around on bikes 80% of the time. We use our cars for rare out-of-town trips and occasional weekend trips within the city. We work hard (by example) to teach our kids that there is another way than the car way. There are other, healthier, safer ways of getting around than driving (or riding in) personal automobiles. The Seattle School District should encourage kids to walk or ride their bikes to school (where appropriate) by providing adequate bike parking at all schools. In addition to the health benefits for students, I’m sure neighbors, who live adjacent to schools, would support the effort to reduce traffic and pollution in the neighborhoods. For students who live in the “walk zone” biking and walking is the quickest, least expensive way to get to school. May is Bike to School month, sponsored by Cascade Bicycle Club. As thousands of elementary, middle and high school students in the district are doing their part by riding their bikes to school, why not show your support of them by making a committment to provide safe and reilable places to park their bikes? This entry was posted in bikes, extravehicular activities, kids, Rack that Bike, seattle and tagged advocacy, bike advocacy, bike racks, bikes, racks, schools, seattle, Seattle School District. Bookmark the permalink. Thank you for your email. I would agree that having student and staff biking to school is an environmentally sound thing to pursue. I am forwarding your comments to the head of facilities Mr. Gilmore to see what the impact of adding bike parking to the building standard would have on future projects. There’s a bike rack at an old “colored-only” school that has been shut down for at least ten years. (it was used for other things too) It has a 20-25 bike capacity bike rack that really could be advantageous to my college which is 1/4 mile away. I really want it. I just emailed the mayor, and I want to see if they will donate it. Our campus is really integrated with the community and trying to better the area. Any suggestions on how to go through the ropes to get hooked up with it?